Dza Patrül (or Paltrül) Rinpoche Jigme Chökyi Wangpo was born into the Getse Kongma clan in the Dzachukha Valley, in 1808. Upon his birth, he tried pronouncing the syllable Om, and five days later he was clearly heard reciting Avalokiteshvara’s mantra of great compassion, Om Mani Peme Hung. These same syllables were visible on his neck, as was the syllable Hri on his tongue. Although he was the speech incarnation of Jigme Lingpa, both the great bodhisattva Dola Jigme Kalzang and the First Dodrubchen recognised him as the incarnation of Palge Samten Phüntsok (hence his name, Pa trül, “the tulku of Palge”). Therefore, at a young age, he was brought to Palge Latrung, the residence of the previous Palge. He then studied under many masters and teachers, applying himself with great zeal to a wide range of subjects, in particular those of Sutra and Tantra. Through this, he attained a perfect level of scholarship. At Dzogchen monastery, he received the ordination vows from Sengtruk Pema Tashi, and transmissions of the Nyingthig Yabzhi and Longchen Nyingthig from the fourth Dzogchen Rinpoche and Gyalse Shenpen Thaye. His root Gurus, however were Jigme Gyalwa Nyugu and Do Khyentse. Under the guidance of Gyalwa Nyugu, he trained in the complete path, from the preliminaries all the way up to Dzogchen. He received the instructions and completed the practice of the Longchen Nyingthig ngöndro twenty five times. Later, Patrül Rinpoche would base his famous ngöndro commentary, Kunzang Lame Zhalung (The Words of My Perfect Lama) on these teachings that he had received from Gyalwa Nyugu. Although Gyalwa Nyugu had introduced him to an initial experience of the nature of mind, Patrül Rinpoche would later credit Do Khyentse with bringing this first taste to maturity. One day, Do Khyentse arrived at Patrül’s tent and demanded that he come out. As soon as he emerged, Do Khyentse threw him to the ground and proceeded to drag him around in the dust by the hair. Smelling alcohol on Do Khyentse’s breath, Patrül began to have doubts about the great master. Knowing Patrül’s thoughts, Do Khyentse suddenly stopped dragging him around, and shouted, “You intellectual people! You have such evil thoughts, you old dog!” He spat in Patrül’s face, showed him his little finger (a grave insult) and departed. Patrül’s conceptual grip on reality was shattered, and he experienced the nature of his mind directly. He would later jokingly refer to himself as the “Old Dog Patrül”, even signing some of his compositions with this name. Around the age of twenty he left the monastery setting and took to the life of a wandering hermit. After receiving the Nyingthig Yabzhi and Longchen Nyingthig transmissions from the Fourth Dzogchen Rinpoche, Patrül spent many years in retreat in the caves around Dzogchen Monastery; places blessed by Dodrubchen during his many years of practice. He put all his energy into the practice of meditation, which caused his realisation to expand as vast as space. At the age of forty-three (1851), he joined Gyalse Shenpen Thaye (who was by this time the regent of the late Dodrubchen) in Yarling Pemakö, and was first made assistant and then put in charge of the annual Guhyagarbha-tantra teachings. He then set off wandering, expounding texts such as the Bodhicharyavatara (The Way of the Bodhisattva), the treatises of Maitreya, the Dosum Namnge (Three Sets of Vows) and Yönten Dzö (Treasury of Precious Qualities), and inspiring the local populations of Ser, Do, Mar and Dzika valleys to recite the mani mantra. After staying for some time at Shukchen Tago, the hermitage that had belonged to the First Dodrubchen, Patrül Rinpoche moved to Ari Forest, on the bank of the Do River. There he maintained a life of utmost simplicity, living at the foot of a tree at Ari Nak (aka Dhichung Phuk), an open field in the middle of the thick forest. At first, only his disciple Nyoshül Lungtok (1829-1902) stayed with him, but soon, despite the difficult living conditions, many disciples gathered to receive his teachings. Patrül Rinpoche would teach from texts such as Semnyi Ngalso (Finding Ease in the Nature of Mind) and Yönten Dzö and give his disciples instructions. They would then disappear into the forest in order to put his teachings into practice. In 1856, Patrül Rinpoche heard that Do Khyentse had arrived in Golok, and so he made the long journey to meet him. After their joyful reunion, Do Khyentse bestowed the empowerment of Yumka Dechen Gyalmo of Longchen Nyingthig upon him and, together with the Second Dodrubchen, they performed a sang ceremony. Do Khyentse also made the prediction that Patrül Rinpoche would live to the age of eighty. He remained in the Do and Ser valleys for a further ten years, teaching the Bodhicharyavatara at many places, after which, in the late 1860’s, he returned to Dzogchen Monastery. 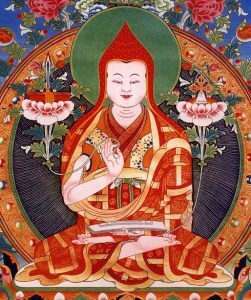 At Dzogchen he taught a wide range of texts and practices at the Sri Simha Shedra and at the hermitages of Padme Thang and Nakchung. In the latter part of his life Patrül Rinpoche returned to his homeland in Dzachukha, where he spent many of his remaining years putting great effort into completing the famous Dobum Mani Wall, a huge complex of walls composed of large stones, each one bearing many carvings of the mantra Om Mani Peme Hung. Upon its completion it was consecrated by the great Jamyang Khyentse Wangpo (1820-1892). Patrül Rinpoche settled near the relics of his root Guru, Gyalwa Nyugu, at Dzagya Gön in Dzachukha. He continued to teach until the age of seventy-six when he gave his last public teachings, on the Dewachen Aspiration Prayer and the Mani Kabum, to a crowd of over a thousand at Dza Mamö. However, he continued to give instructions and advice privately. In 1887 he began to show signs of illness and, one morning after drinking his tea, he sat up with his hands on his knees, snapped his fingers and then passed into the dharmakaya. As predicted by Do Khyentse, he was eighty years old. All that he possessed at this time were his robes, a few texts and a bowl. Patrül Rinpoche widely extolled the virtues of renunciation and bodhicitta, qualities that he himself embodied. Wherever he went or lived he owned very few belongings, usually just copies of the Bodhicharyavatara, Manjushrinamasangiti, and Longchenpa’s Dzödün (Seven Treasures). He taught all, without sectarian prejudice or favouritism towards those of wealth and status. In fact, such was his straightforward manner and unassuming bearing, that many of those who would otherwise ‘put on airs’ regarding their learning or rank, found themselves humbled and embarrassed in his presence. His ragged appearance and lack of retinue and possessions gave no indication of Patrül Rinpoche’s great realisation and scholarship. There are many stories of his being mistaken for an unlearned, shabby monk, and even a case of him being taught his own text, Kunzang Lame Zhalung, by someone not recognising him to be its author! However, many great and learned masters flocked to his encampment and he came to be considered as one of the greatest masters of the nineteenth century. He was also one of the figures instrumental in contributing to the Rimé (or non-sectarian) movement, which would have such an important role in the survival of the different practising lineage transmissions in the twentieth century. Among his closest disciples were Nyoshül Lungtok Tenpai Nyima, Önpo Tendzin Norbu, Tendzin Drakpa, and Minyak Kunzang Sonam. Patrül Rinpoche taught all of the learned and accomplished Nyingma masters of his day, and also a great many from the Kagyu, Sakya and Gelug schools. He revived the tradition of teaching the Guhyagarbha-mayajala-tantra (Secret Essence Tantra), and the traditions of experiential guidance and tsalung practices for the Longchen Nyingthig. He helped ensure that the Bodhicharyavatara, which he taught ceaselessly (Minyak Kunzang Sonam and Nyoshül Lungtok received it eighty times), became an essential guide for those following the monastic path, and that the mani mantra permeated the lives of countless people. He wrote a number of important works that are influential not only in the Nyingma school, but throughout the Tibetan Buddhist world, such as the aforementioned Kunzang Lame Zhalung; a Dzogchen commentary to Garab Dorje’s Tsiksum Nedek, and a commentary on the Abhisamayalamkara.